The first thing you'll notice when loading up the RB2 main menu is a notable lack of "Solo" or "Career" modes in its options. RB2 has opted out of a typical solo career mode. Instead, "Tour" and "Quickplay" are both playable by one person. This means you can now partake in the fun, engaging atmosphere of the Tour without having to learn how to play two instruments at once or find another bandmate to jam with. The drawback is that you no longer have the option of a straightforward mode to simply go through each song and monitor your progress. Playing a song once unlocks it, and Quickplay is a quick way to select from the songs that you have available. Naturally a first intention for many players is to play through and unlock all the new songs; short of using the unlock all cheat∞ which disables online play and the ability to save, there is no simple way to do this. While Tour essentially accomplishes the same thing as having a single-player career, the "play this tier to unlock the next tier" type of mode no longer exists. Tour is arguably a more entertaining way to unlock songs, but is also much more time-consuming since setlists often end up repeating the same couple songs you already have unlocked. With smart planning you can limit the duplicate songs, but casually playing through Tour there is little indication of which songs you're missing and which you've unlocked. After selecting Tour from the main menu, there are several options including Tour, Challenges, Battle of the Bands, and some other options to customize your band's look. Tour is the mode that's synonymous with Rock Band's famous Band World Tour. If you aren't familiar, this basically involves playing gigs at various cities across the world, and unlocking new venues as you gain more fans and money for support and transportation. Gigs may be single songs, predetermined setlists, mystery setlists, or custom setlists that you create yourself by choosing the songs to play. In RB2 there's a bit more flexibility in the setlists, for example one set might consist of three songs you choose plus one random song. It looks as if most of the major complaints that the first game's World Tour mode garnered have been addressed and fixed for the sequel. One of the few complaints about Band World Tour in RB was the lack of DLC integration. The only way to play DLC was to select it for a customized setlist or to have it appear as a random song - this has not changed in RB2. However, focusing on the disc songs makes sense when DLC varies per person and those owning a large collection of songs would rarely get the chance to play RB2 disc songs in Tour without having any focus. 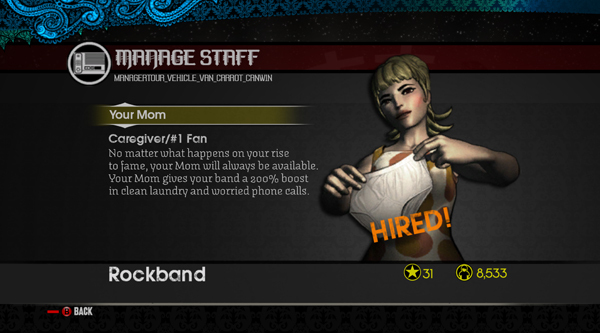 For those that remember the "double or nothing" type of risks that you could take in Band World Tour where you earned more fans or money for better performances - these have been expanded upon in RB2 with the addition of "staff members" that influence your band's popularity, value, and risk-taking opportunities in unique ways. Only a single staff member may be hired at any given time, but you're free to change them up as often you'd like and different people become unlockable over time. So whether your goal is to build up fans to compete on the leaderboards, or cash to improve your look, there's always someone right for you. 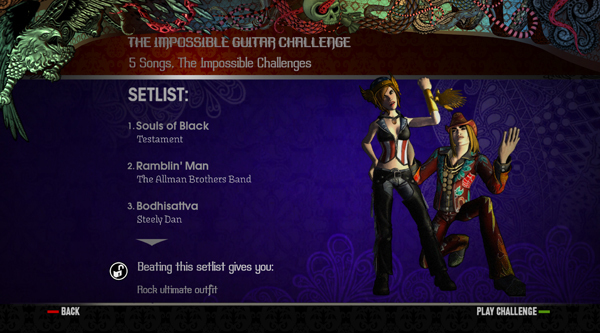 This section allows you to play "challenges" which are nothing more than predetermined setlists grouped by difficulty. First you choose from one of seven different difficulties, and then the specific challenges inside are selectable. The structure is basically linear in two directions; after completing a challenge, the difficulty above becomes unlocked in addition to other surrounding challenges within the same difficulty. This allows progression to move up and play harder sets when you're ready, but you also won't get tired staying at the same level as new setlists will be discovered. Each challenge typically has its own theme with songs chosen from the same genre, album or artist. New challenges do become available for DLC if you own the songs needed for the challenge. If you're looking for the fastest way to legitimately unlock everything, each challenge difficulty contains two six-song marathons which covers everything on the disc. Keep in mind however that while challenges will earn money, no fans will be gained! 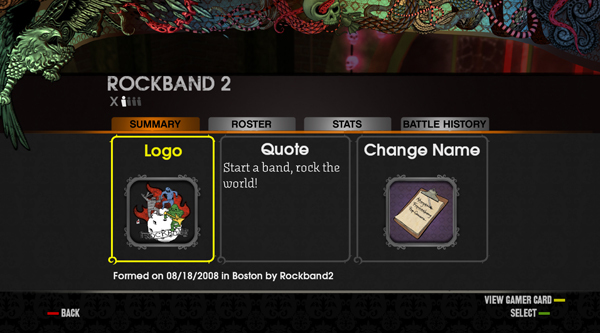 One of RB2's new features is a mode called "Battle of the Bands". 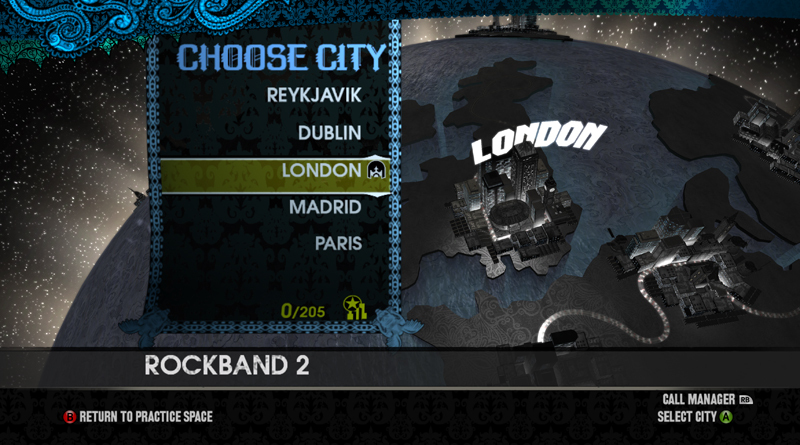 In order to have access to this mode, you must be connected online and be connected to Rock Band Central (to do this, just sit at the main menu until the text underneath the menu shows that you are connected). If you have done any challenges before, the game will update you if a band has beaten your score on it and inform you of your most up-to-date ranking; if it is your first time loading up the Battle of the Bands and you haven't done a challenge before in Tour, the game will take you straight to the challenges menu. Challenges come in three basic flavors. The first is a streak challenge, which are normally solo players playing a difficult-to-combo song, and in place of a score in the top right corner, you will see a streak indicator. It is worth noting that it will always display the highest streak you have obtained and not the streak from the beginning of the song onward, so if you break combo early on in the song and hold a combo through the rest of it, it will keep your higher one. The second kind of challenge is a star rating challenge. In these challenges, you or your band will play a set list of normally 3 songs that have something in common with one another (the Stalker Challenge occurring at the moment of this writing contains the songs "One Way or Another", "Hungry Like the Wolf", and "You Oughta Know", which all have a creepy vibe if you listen to the lyrics; the Literal Challenge has a set list of "Hello There", "The Middle", and "Last"). Your band will play through these songs in set list fashion and try to obtain as many stars as possible on the songs and are combined for a final result at the end. Two things worth noting on this however. Firstly, it is possible to obtain more than 6 stars on a song, so it is possible to receive more than 18.00 stars for a set list of three songs. Secondly, your combo and Overdrive transfer between songs, so if you ended the first song with a 4x and a half bar of Overdrive, you will start the second song with a 4x multiplier and a half bar of Overdrive. This is very useful if a final activation of one song doesn't give you very many points, but the next song before its first Overdrive activation has a lot of points available. The third type of challenge is a straight score challenge, where you play through a setlist of songs and try to obtain the highest possible score for the songs. Again, the multiplier and overdrive transfer between songs, so in some cases, it may be a better idea to save a weak Overdrive activation from one song and transfer it to the next song. The Rock Band forums have given away small prizes to the winners of challenges. It's mostly just swag, but it's nice that you're getting a physical reward for the competitions. When you finish a challenge, you are taken to the appropriate result screen. The screen is the same as you'd see from any song screen, showing your total score of the set list (or total combined star ranking if you're doing a star challenge) and the percentage and highest note streak from all of the songs in the challenge (again, note streak carries over from songs, so don't be surprised if you get an abnormally high number here). You are then taken to another screen after this that shows your ranking on your friends list, global ranking, and grants each member of the band money depending on the challenge. If you need some quick cash, Battles are an easy way to make a few hundred dollars per set list. Battle of the Bands is a very nice touch to the game. Since each challenge normally lasts about a week, the challenges available are always changing and because Rock Band is actually giving away prizes, the competition for each challenge is relatively fierce. All in all, it's a nice, fun mode, and adding in the possibility for cash to deck out your character while doing them makes for a very successful game mode. Once you've collected all this money you need a place to spend it. One of the options in Tour after signing in on your band is the Rock Shop where can purchase endless amounts of clothes, accessories, and instruments to outfit your character. This area hasn't changed much from the original game, all of the outfits/tattoos/haircuts are present and only a scant few new ones have been added. They did add an additional store section to purchase from titled "Thrift Clothes" where all of the clothes are pretty cheap and sport a nice Hobo Harry look, it's about as close to a grunge store as we're likely to get in the game. There are a few options available to you to customize your band, but really nothing new from the first game. You can still give yourself a clever name, make a bitchin' logo, announce to the world an official quote from the band and replace members that aren't up to snuff or designate stand-ins if you don't like the stock characters the game fills out your band with when you're missing some human members. A nice new addition is the option to view stats of the band, things like number of fans and stars earned so far, your total career score and the songs you've performed best at. If you've done a few of the Battle of the Bands battles, you'll also be able to see how you've ranked in those.